We begin today the study of another of Paul’s wonderful letters to the churches. It was written at about the same time as the letter to the Ephesians and send by the same messenger, Tychicus (ch. 4:7, cf. Eph 6:21). It contains many of the same truths that are contained in the letter to the Ephesians, but those truths are looked at from another point of view. Its agreements with and differences from the Epistle to the Ephesians are alike interesting and significant. These agreements and differences are well set forth by Bishop Moule in a scholarly yet popular way in the Introduction to the Epistle to the Colossians in the Cambridge Bible for Schools and Colleges. The one great distinctive doctrine of this epistle is that Christ Jesus, the Son of God, is “the first born of all creation,” the source and head not only of the church but of the whole created universe, the heavens and earth and all they contain, including the thrones and dominations and principalities and powers and the invisible angelic world. Its great theme is the fullness that there is in Christ and our fullness in Him. The reader of these notes should read the book through carefully and thoughtfully and prayerfully four or five times at one sitting before reading these notes. Paul is the writer of the letter. He speaks of himself as “an apostle of Jesus Christ.” “Apostle” means “one sent,” an envoy. Our word “missionary” means the same by its derivation, but the word “Apostle” in its New Testament usage is limited to that small company of men who are immediate delegates or ambassadors of Christ, especially commissioned and equipped by Him for the work and able to show the reality of their apostleship by certain signs that marked an apostle off from other men (2 Cor 12:12). In order to be an apostle one must have seen the Lord Jesus, and have actually seen Him after His resurrection (Acts 1:21, 22; 1 Cor. 15:8,9). Other men were spoken of as “apostles” (or envoys) of the churches” (cf. 2 Cor. 8:23, R.V. ), but these few selected and especially endowed men who laid the foundation of the church have no successors. Paul associates the name of Timothy with his own as the author of the epistle, or of the opening salutation (cf. 2 Cor. 1:1; Phil. 1:1; 1 Thess. 1:1; 2 Thess. 1:1; Phile. 1). In this epistle the association of Timothy with himself is carried along further in the thought than in some of the epistles. In the epistle to the Philippians it is dropped after the second verse and then Paul appears alone. In this epistle it is carried along to the twenty-third verse. Timothy is mentioned no less than twenty-four times in the New Testament and he was a young man of very lofty character, honored and beloved not only by Paul, the great apostle, but by God himself. Here Paul speaks of him as “the brother” (in both Authorized and Revised Version it says “our brother” but the Greek says “the brother”). That is really a more honorable title than “Doctor of Divinity.” Just think of being “the brother” of Paul. 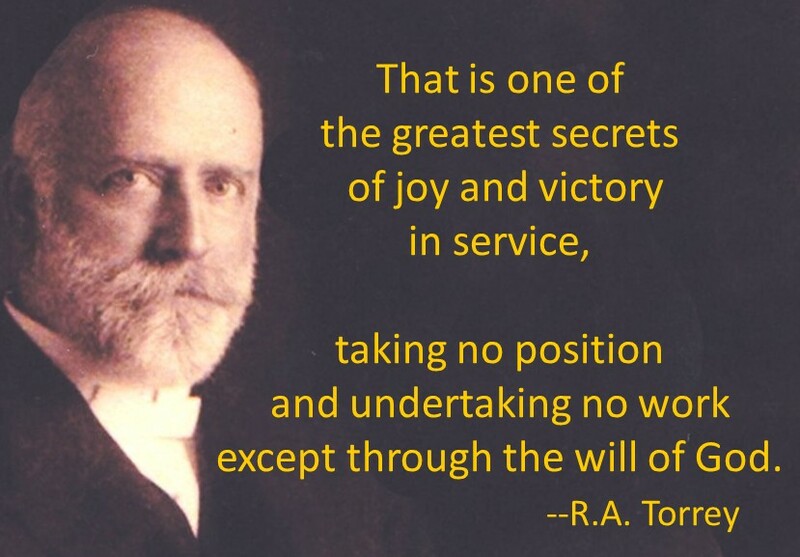 Reuben Archer Torrey (1856-1928) helped found Biola University. A graduate of Yale, he pastored churches, wrote books, and toured the world on evangelical campaigns. His Statement of Doctrine is still held by Biola. Read more about Torrey here.